Saturn gets a bad rap in much of astrology. We tend to think of it as delivering a punishment or bringing chaos to what we thought was a stable situation in our lives. “You reap what you sow” is often used in reference to Saturn, as it seems to bring the metaphysical smack down on unsuspecting people. In truth, planet Saturn is a teacher. Like all good teachers, Saturn will use whatever tools are available to fulfill the lesson plan. It does not have to bring chaos, punishment, or discomfort to people … provided that they are dealing with their issues before it returns. Unfortunately, most people refuse to confront the pink elephant in the room until it is sitting on their chests. 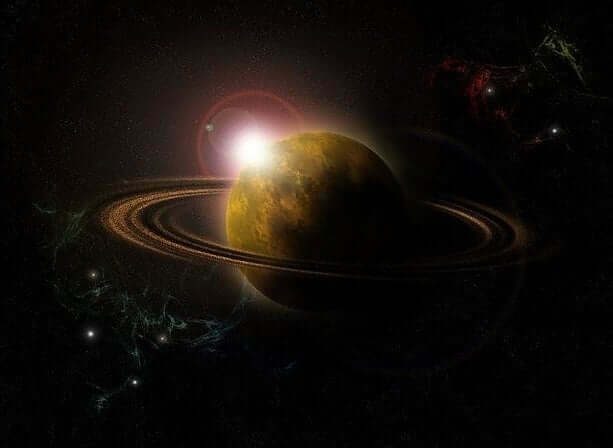 When working within the Chaldean Ordering of Planets, Saturn is the slowest moving planet in our solar system. Actually, it is a slow-moving planet in any system, taking 27.5 years to return to the same spot in its orbit. In Natal Astrology, this is called The Saturn Return. As I said, it takes Saturn roughly 27.5 years to return to where it was in the sky on the day you were born. When that happens, most people experience a rough patch in their lives, which is why the years between 25 and 30 are so hard for most people. Among its many areas of influence, Saturn has sway over such areas of life as responsibility, discipline, self-control, limitation, patience. These are things most of us want to run away from. How often do we hear our friends say things like “Patience is NOT my strong suit!” or see them start a diet only to stop it two weeks later? Our lives are filled with failed Saturnine attempts, so you can see why things go “wonky” for us when Saturn returns to its original place in our birth charts. The good news is that IF you are the type of person to confront your pink elephant before it sits on chest, if you endeavor to keep your word, if you exercise discipline, patience, and self-control, you are less likely to feel the metaphorical smack down that I have been talking about. Nobody can change the past, but we can all learn from it. Remember what the years between 25 and 30 looked like for you. If you are younger than 25, take special notice of this article. Do yourself a favor and begin researching the effects of Saturn. Prepare yourself for its return, and confront your elephants now. For those of you older than 30, there is some consolation. You are wiser because of the experiences you had during your Saturn return, and if you paid attention, your next run in with Saturn, which will happen around 55 (can we say mid-life crisis?! ), does not have to be so devastating. In fact, it can be a real enjoyable experience … provided you choose to take responsibility before Saturn makes you. That’s all well-and-good if you were proactive, but what happens if you were caught off-guard by these Saturnine energies? What do you do once Saturn has returned and is impacting you in the moment? My personal opinion, and, keep in mind you may not like this, is to just go with the flow. Ride it out as best you can, and be open, honest, and upfront in the moment.